Biryani is a flavourful and delicious rice that is a must have during most feasts and special occasions in India. It is usually prepared in a large vessel with dum (seal) to keep its flavor and aroma intact. Today I am going to share an easy way of making delicious mutton biryani, the way we make at home, in a pressure cooker along with a video. Heat oil in a pressure cooker, add cardamoms, cinnamons, cloves and sliced onions. Saute till the onions turn golden. Add garlic and ginger paste and saute till the raw smell goes. Next add salt, red chilli powder and mix well. Now add tomato puree and mix. Cook for a couple of minutes till oil starts separating. Then add curd, coriander and mint leaves and mutton pieces. Mix well, add 1 cup water and close the lid of the pressure cooker. Cook for 2 whistles. The meat has to be only half cooked. Once the steam has come out, open the lid and add lime juice. Add the rice and spead evenly. Add 1 tsp salt and 2 cups water and mix well. Mutton biryani is ready to be served. 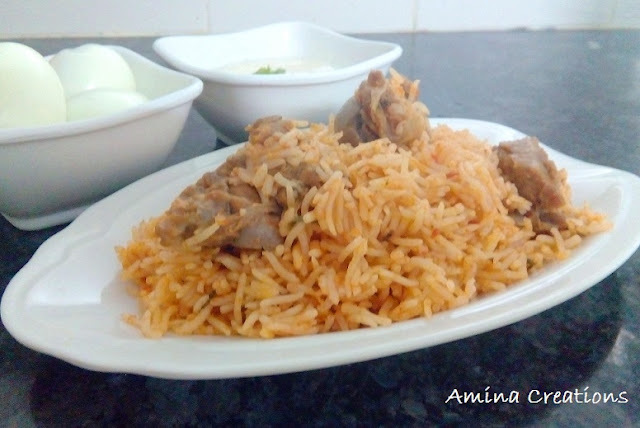 When we pressure cook the mutton with a cup of water, is there not water still left after? Should we drain that out? For veg also same Recipe? Instead of mutton can I use veg? Or any other method?